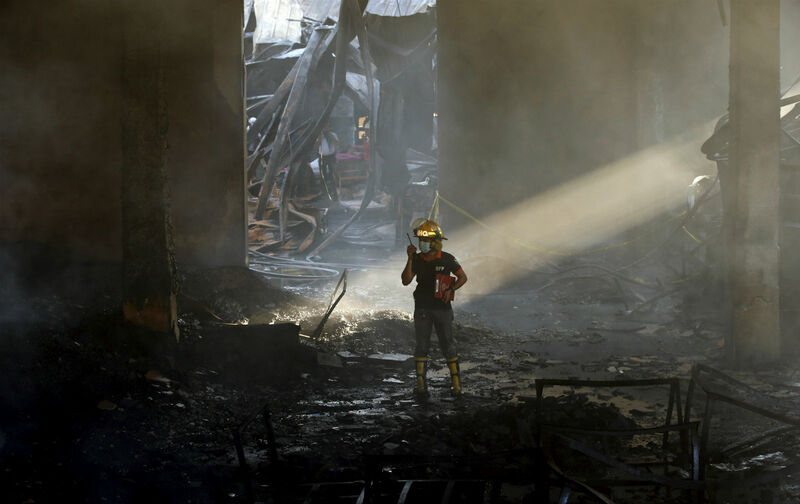 The fatal fire at a Philippines shoe factory exposes the ills of global free trade. The deaths of 72 workers at a sandals factory in the Philippines earlier this month is sadly not shocking news; risk of mass death is practically considered a regular cost of doing business in the regional factories. But the blaze coincides with two grim anniversaries for Global South labor: the death of more than 1,100 workers in the Rana Plaza factory collapse in Bangladesh in 2013, and the subsequent launch of a landmark safety program for Bangladesh factories. Today, it all adds up to a tragically uneven record of reform in Asia’s low-wage, high fashion manufacturing system. Conditions at the Kentex Manufacturing facility in Valenzuela, which produced shoes for the domestic market, were painfully familiar, according to auditors and news reports: workers were reportedly paid well below minimum wage, worked half-day shifts, and braved toxic fumes without proper protective gear inside poorly ventilated, often sweltering factories. Research on the disaster by a coalition of NGOs, including the Center for Trade Union and Human Rights, Institute for Occupational Health and Safety Development and the trade union Kilusang Mayo Uno (KMU) found that the factory compound was effectively a death trap, lacking basic fire alarms and fire exits, with “only two gates, one… for people and the other… for delivery trucks. The factory windows are covered with steel grills and chicken wire which could not easily be destroyed even during emergencies.” Many struggled to escape by breaking the windows (sealed, the company’s lawyer later explained, to prevent “stealing”), a few jumped from the second floor and some had to scale the walls since the trucks were blocking their path. Yet the trap was well-laid before the first spark. Authorities claimed Kentex was complying with safety regulations, but used illegal subcontractors (officials have since taken enforcement actions). Though workers had what they called a “company union,” even the most senior workers only earned about minimum wage. Many others were hired as agency contractors, who reported more precarious conditions, like having social and health benefit payments withheld. The lowest tier were pieceworkers, with no steady wage, no contract, and 12-hour days. Amidst wrenching poverty, workplace hazards were just the backdrop to the daily struggle to survive. Despite, or because of such abysmal conditions, officials have boosted trade ties, cozying up to Asia’s emergent Regional Comprehensive Economic Partnership, and China’s planned Asian Infrastructure Investment Bank—an alternative bloc to the pending Trans Pacific Partnership. And Valenzuela’s inferno now tarnishes the modernizing city’s dubious distinction as a World Bank pick for one of the country’s most “business friendly cities” in 2011. Multinational manufacturers and foreign investors play a huge role as to why violations of workers’ health and safety in the workplace are violated…. The Philippine government courts their approval for its major economic and employment policies, making it appear that the country is dependent on them for employment and overall economic activity. The liberalization of trade under the dominance of the US has had the effect of worsening the race to the bottom of underdeveloped countries when it comes to workers’ wages, job security and trade-union rights. We have every reason to believe that this is the direction of the US’ new free trade agreement with various Pacific Rim countries. multinational manufacturers and foreign investment should play a lead role in preventing cases of occupational safety and health violations. No worker should die because of negligence of companies and government…. Every trade policy must have accompanying labor protection provisions on it—the right to freedom of association and bargaining and the right to a safe working environment. This crisis is playing out in export industries throughout the Asia Pacific region, despite growing public pressure in the West to promote more ethical production processes. The Bangladesh Accord—a voluntary safety program established by international brands and unions in the wake of Rana Plaza, recently issued its second-anniversary progress report, showing hundreds of factories have undergone inspection. But out of some 54,432 safety hazards identified, only 2,579 issues had been fully corrected. The grassroots advocacy that pushed through the Accord was seemingly eclipsed by countervailing market forces: global retail fashion sales are nearing $2 trillion annually. The Philippines, where factory worker wages are typically more than double those of Bangladesh, supposedly represents a higher standard of “development.” But the pressures of the market nevertheless led to the deaths of dozens of workers, trapped behind barred windows.